When I went to have my annual mammogram this past June, I was reminded by the radiologist that I have dense breast tissue. This meant that I needed additional screening, and for me that came in the form of an ultrasound. My mammogram was clear, but it was my ultrasound that ultimately led to my breast cancer diagnosis. This frightened me. Do other women out there understand that they too might have dense breast tissue? After doing some research, I found that not all medical procedure relating the reporting of "breast density" by radiologists to patients is the same across the country. In fact, only certain states have laws that require radiologists to alert patients of their "breast density" report. These reports include instructions to speak with a physician regarding supplemental screening options. This is what saved my life. One article that I found very helpful in understanding the information I needed to know, was by Dr. Stacey Vitiello. While some of the legislative information in this article has evolved since its' publication, the information about the importance of breast density reporting stands strong. I encourage ALL women to inquire about and understand their own "breast density" to make informed medical choices for themselves. Keep checking www.JoanLunden.com for updated information regarding "breast density" and related legislation. Click photo to read more…. 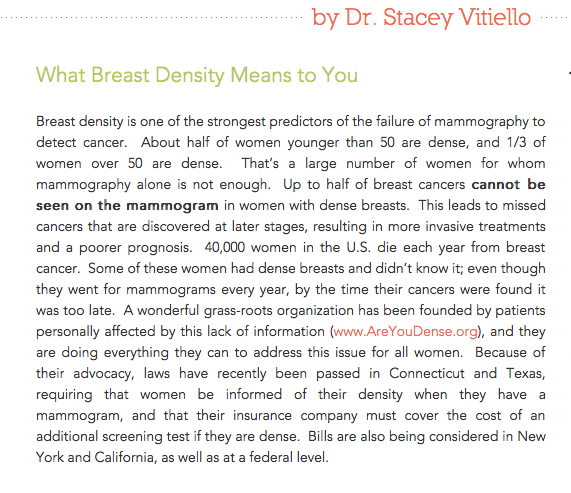 Find out more about Breast Density here: Once “Dense”, Always Dense?